Tale 67 covers the AI AF-S Zoom-Nikkor 80-200mm f/2.8D IF-ED, a fast (bright) telephoto lens that was the first "AF-S" NIKKOR lens, now a line of lenses equipped with Nikon's original Silent Wave Motor (SWM). This lens was released at the height of the silver halide film age. Just before the dawn of the digital age, it was somewhat of a confused time. However, fast telephoto zoom lenses designed with consideration of digital support were already being released. With this Tale, we will uncover some of the secrets behind one of these, the AI AF-S Zoom-Nikkor 80-200mm f/2.8D IF-ED. First, let's track the evolution of 80-200mm f/2.8 NIKKOR lenses. The AI AF-S Zoom-Nikkor 80-200mm f/2.8D IF-ED was released in December of 1998. At this time, development of Nikon's new D1 digital camera, scheduled for release in 1999, was already well under way. Naturally, this lens was also designed to support good digital image quality based on new design criteria. 80-200mm f/2.8 specifications have a long history at Nikon, beginning with the AI-S Zoom-Nikkor 80-200mm f/2.8 ED designed by Yoshinori Hamanishi and released in 1982. This was followed by the smaller AI-S AF Zoom-Nikkor 80-200mm f/2.8 ED, which was released in 1988 and supported autofocusing. This design had a long life. It continued with the new AI AF Zoom-Nikkor 80-200mm f/2.8D, released in 1996 with no noteworthy changes to optics, as the age of camera-driven AF continued. 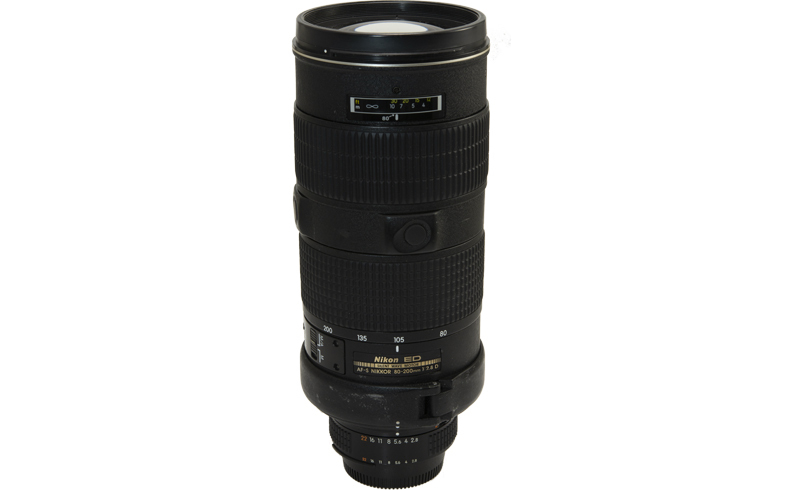 Then, in December of 1998, the AI AF-S Zoom-Nikkor 80-200mm f/2.8D IF-ED, a fast telephoto lens that was the first to utilize Nikon's Silent Wave Motor (SWM) was released. 80-200mm f/2.8 specifications finally relinquished their role to the AF-S VR Zoom-Nikkor 70-200mm f/2.8G IF-ED, which was released in 2003 and offered an expanded zoom ratio, was equipped with a vibration reduction (VR) mechanism, and had an even smaller diameter. The AI AF-S Zoom-Nikkor 80-200mm f/2.8D IF-ED sold for approximately five years. AI AF-S Zoom-Nikkor 80-200mm f/2.8D IF-ED optics were designed by a cohort of Kouichi Ohshita and myself, Susumu Sato, another Sato who was known to us as "the gifted Sato". Sato was a coworker who remains a trusted friend to this day. Originally, he had the same great interest in astronomy that Ohshita had. Therefore, he had a unique way of looking at optical design. The lenses he designed include the AI AF-S Zoom-Nikkor 80-200mm f/2.8D IF-ED as well as 300mm, 400mm, and 500mm AF-I lenses, and 300mm, 400mm, 500mm, and 600mm prime and 200-400mm and 1200-1700mm zoom AF-S lenses. As you can see, he was engaged in designing all super-telephoto AF designs during the silver halide film age. Sato primarily designed telephoto zoom lenses and super-telephoto lenses, but well before the coming digital age was predicted, he also brought about innovations in the correction of axial chromatic aberration. With the switch from AI to AF, fast telephoto NIKKOR lenses changed significantly. That was the result of perfect (more than adequate) chromatic aberration compensation. Sato's promise was to ensure that when teleconverters were used with lenses utilizing new designs, the levels of performance and chromatic aberration exhibited by the teleconverter/lens combination was superior to that of other lenses of the time with the equivalent final focal length (combined lens/teleconverter focal length). For example, he decided to design a new 300mm f/2.8 lens. When a 2x teleconverter was used with the newly designed 300mm lens, performance and chromatic aberration characteristics had to be better than those of the current 600mm f/4 lens. A 2x teleconverter increases axial chromatic aberration by four times. Therefore, axial chromatic aberration for the newly designed lens had to be reduced to 1/4 that of the current stand-alone lens (with double the focal length). 1/4 may not sound like much, but to an ordinary optical designer it is a mind-boggling target. It is certain that Sato thoroughly reconsidered every aspect with his new designs, from lens type and structure to the glass materials used. In short, his new lenses had to offer a level of performance that thoroughly compensated for any drop in performance that occurred when a teleconverter was used. The resulting lenses themselves offered such a high level of performance that one might even consider them to be of excessive quality. That was the heavy cross he imposed upon himself. However, Sato was amazingly successful. That was his genius. Sato's design concept forms the basis of today's telephoto and super-telephoto NIKKOR lenses. Now let's take a look at the history behind development of the AI AF-S Zoom-Nikkor 80-200mm f/2.8D IF-ED. Work on the design began in the spring of 1997 with the final design completed in September of 1997, when the intense summer heat still lingered. Soon afterwards, trial production of the long-awaited lens began. Mass production was then initiated in Tochigi during the chilling winter that was February, 1998. The lens was finally released in December of the same year. First, take a look at the cross-section of the AI AF-S Zoom-Nikkor 80-200mm f/2.8D IF-ED (Fig. 1). Please forgive me if the following is quite technical. This zoom lens has a four-group (positive/convex, negative/concave, positive/convex, positive/convex) afocal structure common to telephoto zoom lenses. First of all, it should be noted that the time-tested standard for fast (bright) telephoto zoom lenses is the positive/negative/positive/positive (convex/concave/convex/convex) afocal-type lens that was a major invention of Souichi Nakamura (see Tales 42 and 61). It is the dominant zoom lens type used by manufacturers around the world. This lens evolved from the typical afocal zoom in that the first group is divided into a front and rear group with the rear group doing the focusing. This represents the switch to what is now known as internal focusing (IF). It can be said to be the result of the need to adopt the Silent Wave Motor (SWM) as well as professionals' dislike of changes in total length. Unfortunately, early SWMs were not as powerful as expected. This imposed significant restrictions on the focusing group. First was a weight restriction. Next were restrictions on the amount of movement. Then there were restrictions on the external diameter. All of this would simply be too much for an ordinary optical designer. However, Susumu Sato persisted and prevailed without ever losing his poker face. The early ring-type SWM, which we called then "the headband of Sun Wukong" (Monkey King), was a nightmare for optical designers. Let's get back to the lens cross-section. 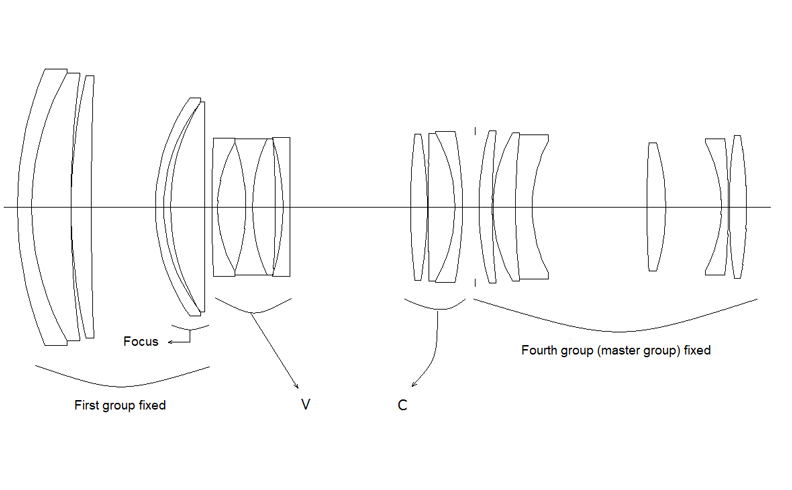 You can see that the lens has a variator (V) group and a compensator (C) group behind the first group (closer to the focal plane), followed by the fourth group (master lens). Afocal zoom seems difficult, but it is actually very easy to understand. First, think of the master lens group as a normal lens usually attached to a camera. Then think of the telephoto effect being achieved with an inexpensive Galileo-type (convex, concave) telescope positioned in front of the lens. So how are wide angles achieved? Think of it as if the Galileo-type telescope were reversed (turned around) and then positioned in front of the lens. It's as if a reverse-Galileo-type (concave, convex) afocal converter were positioned in front of the normal lens. Every child has looked through binoculars the wrong way, and laughed at how small everything appears. That is just what is happening here. With the actual lens, the variator (V) group moves forward (toward the object) with wide angles. It moves closer to the first group. The simplest way to think of it is as if the first group's positive power is overcome, becoming negative power by the combination of group 1 and the variator (V) group. It is a concave, convex structure similar to that of retrofocus lenses. At the telephoto position, the variator (V) group moves back toward the focal plane, which makes it a convex, concave telephoto-type lens. The focal plane moves when the variator group moves. The compensator (C) group moves in a nonlinear fashion to make the moving focal plane constant. The primary purpose of compensator (C) movement is not to vary power, but rather to maintain a constant focal plane. The compensator (C) is a lens group that "compensates" focus position. Now let's take a look at the aberration characteristics of the AI AF-S Zoom-Nikkor 80-200mm f/2.8D IF-ED. We'll begin at the wide-angle 80mm position. The first thing we notice is that compensation for spherical aberrations and various types of chromatic aberration is quite good. Spherical aberration is slightly under-corrected. Axial chromatic aberration is also corrected to a degree equivalent to that of an apochromatic lens, proving that the AI AF-S Zoom-Nikkor 80-200mm f/2.8D IF-ED is designed to stand up well to aberrations. Further, coma is almost completely suppressed, and point images are reproduced with a pleasing round shape that reflects design intent. Curvature of field leans a little in the positive direction, but this is likely the result of efforts to achieve a good balance in terms of performance with capture of both near and distant objects. Distortion measures -3.6%, which is a common value for telephoto zoom lenses. Next let's take a look at aberration at the mid-range 135mm focal length. Spherical aberration is slightly over-corrected. Surprisingly, there is even less axial and lateral chromatic aberration (by a factor of 10) than at the wide-angle position. Coma is also almost completely suppressed. Curvature of field is nearly perfectly corrected to about 85% of the image height, but beyond that, gradual curvature in the negative direction can be seen. Distortion is almost completely corrected, with 0.3% at most. Finally, let's look at results at the 200mm maximum telephoto position. Spherical aberration at infinity is extremely low (within ±0.01 mm), allowing users to expect extremely sharp and clear images. This gradually shifts to the negative direction as the shooting distance decreases. Even axial and lateral chromatic aberrations are measured at levels one would never expect at 200mm. Distortion measures +1.7%, which is good for a telephoto zoom lens. One weakness is the visible curvature of field at higher image heights, showing a significant shift in the negative direction. However, much of this is caused by the one-sided aperture mechanism. It can be considered a sacrifice that helped to achieve a smaller lens. If we look at point image formation next, we see that this lens is relatively consistent regardless of the focal length. This lens exhibits very good point image reproduction, clearly rendering points as points, up to about 70-80% of the image height. However, curvature of field at the extreme edges of the frame cause points in those regions to be elongated in the meridional direction. Now for MTF values. Contrast at both 10 and 30 lines/mm stands up to that of fixed focal length (prime) lenses at all focal lengths. Results are extremely good throughout 70% of the frame, beginning at the center, for more than sufficient contrast even at 50 lines/mm. This lens performs very well in terms of all design values, including aberration, point image formation, and MTF, for extremely sharp and clear images. Next let's look at results achieved with actual telephoto images. Details regarding performance at various aperture settings are noted. Evaluations are subjective, and based on individual preferences. Please keep in mind that my opinions are for reference purposes when viewing sample images and reading the evaluations. The center of the frame is sharp and there is little sense of flare. Rendering is highly precise and also consistent from the very center of the frame and outward somewhat. The edges of the frame are a little less sharp, but even so, it is really only noticeable when the image is enlarged to 100%. Relatively consistent resolution is exhibited throughout the entire frame. Image quality drops a little at the extreme edges of the frame, but there is no unnatural flow or sense of incongruity. There is very little color bleed. Stopping down the aperture to f/4 increases sharpness and contrast. There is very little change at the extreme edges of the frame. At f/5.6, sharpness is increased to the edges of the frame. At f/8, consistent rendering is achieved throughout the entire frame. Resolving power increases. The best image quality is achieved at f/8. At f/11, contrast begins to drop slightly. This is likely where the effects of diffraction begin to show. Even more consistent rendering is achieved throughout the entire frame, but resolution decreases. The effects of diffraction are visible and resolution suffers slightly. There is a little flare at the center of the frame, possibly due to positive spherical aberration. However, resolution is still good. Image quality is consistent from edge to edge. There is no sense of image bleed. Stopping down the aperture to f/4 reduced flare and increases contrast. Details become very clear everywhere except the most extreme edges of the frame. At f/5.6, sharpness increases even further. Image quality tendencies are the same. Consistent rendering is achieved throughout the entire frame. Contrast increases even further. Of all aperture settings, the best image quality is achieved at f/11. An aperture setting of f/11 is best for landscape photos. There is slight flare at the center of the frame, but contrast and resolution are still good. Image quality is consistent all the way to the edges of the frame. Image quality begins to drop only at the extreme edges of the frame. There is no sense of image bleed. Resolution is increased by stopping down the aperture to f/4. At f/5.6, rendering is consistent to the extreme edges of the frame. Images seem to even sharper at f/8. Consistent rendering is achieved throughout the entire frame. Contrast especially is greatly increased. Of all aperture settings, the best image quality is achieved at f/11. An aperture setting of f/11 is best for landscape photos. If sharpness is the goal, the best results would likely be achieved at an aperture setting of f/8 to f/11 at all focal lengths (positions). For portraits, I think that I would set aperture to f/2.8. So that you may judge the characteristics of this lens for yourself, no special compensation for lateral chromatic aberration, axial chromatic aberration, or vignetting has been applied, and image sharpness has not been enhanced. Sample 1 was captured at the wide-angle 80mm position at the maximum aperture of f/2.8. If we look at the model's face, hair, and clothing, we see that the image exhibits pleasantly moderate sharpness. In addition, blur characteristics (bokeh) are gentle without any problems. Sample 2 was captured at around 100mm at the maximum aperture of f/2.8. 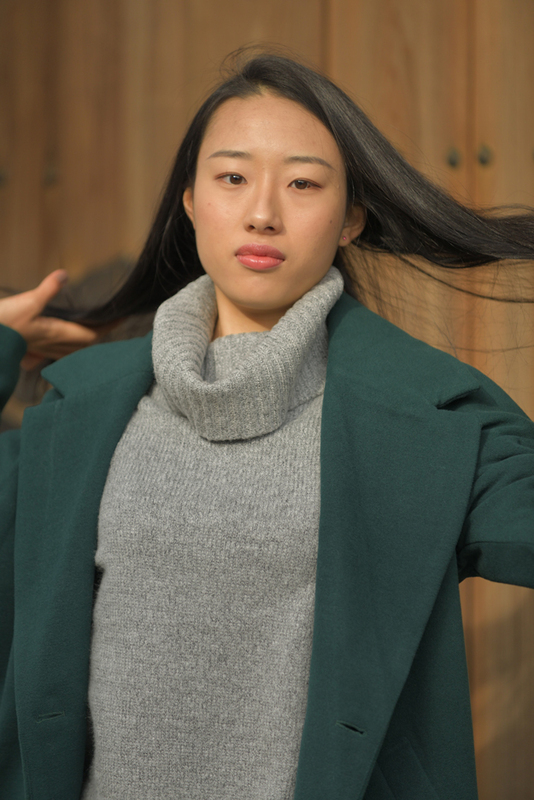 The image exhibits sufficient sharpness, clearly reproducing the girl's hair and even the fibers of her coat. The gentle blur is also pleasing. Coloring is good, and there is little sense of chromatic aberration. Sample 3 was captured at around 135mm at the maximum aperture of f/2.8. This lens exhibits little difference in rendering and a stable degree of sharpness with zooming. Even at this position, the gentle blur is quite pleasing. Coloring is good, and there is little sense of chromatic aberration. Sample 4 was captured at around 180mm at the maximum aperture of f/2.8. This image was captured at the focal length that best demonstrates the unique characteristics of a telephoto afocal zoom lens. You can see that there can be no complaints regarding the sharpness of this image. I even chose a background that tends to illuminate weaknesses related to blur. However, blur is smooth and gentle, with no appearance of double-line blur. It is a very pleasing image that exhibits the necessary degree of sharpness in portions that are in focus-namely the girl's eyes and hair. Sample 5 was captured at the maximum telephoto 200mm position at the maximum aperture of f/2.8. The result is a pleasing image that is sufficiently sharp in portions that are in focus, such as the model's eyes and hair. It is not razor sharp, but rather demonstrates the depth of this lens. There is very little chromatic aberration, and colors are very good. Sample 6 was also captured at the maximum telephoto 200mm position at the maximum aperture of f/2.8. I chose a background for this image that would clearly demonstrate blur characteristics. In-focus portions are sharp and clear, but blur characteristics are also very fine. A repetitive background pattern as seen at the top tends to cause unpleasant blur, but we see no tendency toward double-line blur and the results are very pleasing. Susumu Sato, Kouichi Ohshita, a designer named Atsushi Shibayama who worked on zoom Micro lenses, and myself formed a group named "the 38s" because of our association with 38th year of the Sh&omacr;wa period (1963). In fact, we were all born in Sh&omacr;wa 38 (or 37) and graduated in the same year. More likely, the four of us just got along well and enjoyed drinking together. Even as our positions within Nikon have changed over the years, our relationship, which is based on mutual respect and esteem, has remained strong for more than 30 years. That is a very brief summary of my long relationship with Susumu Sato. There are so many interesting stories and anecdotes associated with Susumu Sato that they cannot even be counted. However, as most of them cannot be told, I'm having a little trouble continuing. What's more, he is a person who always refuses interviews and does not like getting up in front of people. In fact, I really wanted to introduce him much earlier in the NIKKOR The Thousand and One Nights series, but I've always been unable to get his permission. This time, however, I finally succeeded in persuading him. I am so glad to have been able to introduce his distinguished service and good nature to all who read this Tale. I'd like to share one anecdote associated with The Gifted Sato with you here. It happened more than 20 years ago, so I hope he will forgive me. Susumu Sato was originally a hard-working physics major who studied quantum theory. His remarks were, however, completely different from what one would expect from his background. In fact, he had an extremely funny wit and interesting narrative style. He enjoyed everything about conversation and argument very much, and would sometimes just laugh out loud right in the middle of a conversation. However, he also had the ability to observe people calmly and objectively in any situation. One day, it seems he was driving his beloved car on the expressway when he had some trouble with the driver of a large truck. Sato was in the passing lane, but the truck in the slower lane sped up to stay right next to him, gradually moving closer and closer. To Sato's right was a barrier. He quickly grabbed the Nikon F3 riding in his passenger seat. As he did so, the truck hit the side mirror on his car, caused significant damage to it, and sped away as if nothing had happened. It was like a scene from a movie or TV show, but in such an urgent situation, he still managed to capture a photo of the truck's license plate as it sped off. Naturally, he hadn't had the time or wherewithal to actually frame the photo. He immediately reported the incident to the police. When he developed the film a few days later, the photo was in sharp focus, and the offending truck driver was arrested. I was really surprised at how cool and level-headed Sato remained. I'm sure that I would have panicked and caused a terrible accident. Even his response after the fact was regal. The culprit was the employee of a certain transport company. It seems that Sato received a call from the very apologetic president of the company. What would you do? I think that I would probably rage until I burst a blood vessel! Something along the lines of, "I almost died!" or "Was he trying to kill me?!" However, Sato simply told the president that he had probably made some mistakes in his own driving and annoyed the driver, and then apologized for his own behavior. Can you believe it?! That is a very generous and forgiving man. Of course, he did have the company pay for the repairs to his car. When I heard this story, I thought that Sato must be the kindest human being I'd ever met. Ever since, I have consulted Sato whenever I needed advice on dealing with people. That is the same Sato who regularly gets dead drunk, misses the last train, and spends tens of thousands of yen on a taxi ride home. However, he is no mere heavy drinker. I suppose maybe I should call him not "The Gifted Sato", but rather "Sato, The Japanese Dionysus".